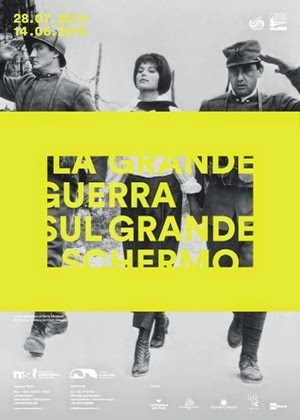 We would like to thank Luca Giuliani, curator with Patrizia Marchesoni, Luca Caracristi and Roberta Tait, for sharing with us the main information related to this Italian exhibition dedicated to cinematographic representation of the Great War on the big screen. Visitors can walk and watch along the special layout developed in the 300 meter Black Gallery location in Trento. All this compelling project was feasible thanks to the cooperation among Museo Nazionale del Cinema in Turin, Cineteca del Friuli, Cineteca Nazionale of Rome, Istituto Luce, Rai Storia and hosted in this very special location of Museo Storico del Trentino. More than 70 titles coming from Washington, Belgrade, Paris and Wien are here available (some previously unpublished). The introduction of the brochure states: "The years of the Great War (1914-1918) coincide with the birth of cinematographic language. To propose an exhibition that examines the relationship between World War I and cinematography also means to tackle the more disquieting aspects of modernity. This approach has generated authoritative historical interpretations of the last decades, and the layout of this exhibition illustrates the outcomes based on a set of comparisons. Different images, themes and points of view are set side by side in analogy or in contrast so as to highlight the areas of ambiguity and of contradiction typical of history and its representations. At the core of this tale the exhibition has left the protagonists, namely the men, the individuals who interacted with the masses and with other individuals, with the destruction and with the technology." More information and a precious overview on the titles can be found in the exhition's *.PDF leaflet that you can view and/or download here.